" This meeting of the "Swingin' Soiree"is now in session." As the host of the "Swingin' Soiree," which began in mid-1958, and aired at first in the overnight spot on WINS following Alan Freed, Murray Kaufman built a large following that was already tuning in earlier every day. Then Murray assumed Freed's primetime slot when Freed was fired later that year from WINS shortly before the payola scandals of 1959 caused his total fall from grace. Murray came out OK.
Kaufman was the creative genius who invented both the "blast from the past" and "submarine race watching." He was a true showman, with more gimmicks than all other jocks combined, and he pioneered the radio jingle, some of which can be heard on this page. "Oh you're never too old, and you're never too young, to watch the submarine races on the run. "Just keep your dial on the Kaufman show, and you make a lotta lovin', and you go-go-go. Grand Kook! Grand Kook! Ten Ten WINS! Grand Kook! Grand Kook! Ten Ten WINS!" Lots of DJs did 'round-the-clock "radio-thons" as publicity stunts and to raise money for philanthropic causes (most notably, WMGM's "Curly Headed Kid in the 3rd Row," Peter Tripp, who stayed awake on the air for a then record-breaking 201 hours in 1959). 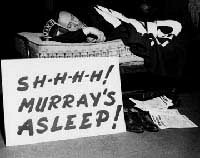 Grabbing an hour's sleep only once every 24 hours, Murray the K did one for WINS, also in 1959, in a New York subway. Although he played mostly rock 'n' roll for us kids, Kaufman broadened his appeal (and his audience) by playing a wide variety of musical styles, for example, he opened every show with Frank Sinatra, whom he dubbed the "Chairman of the Board." Once, he played only Sinatra records nonstop until Frank called in personally to ask him to stop. 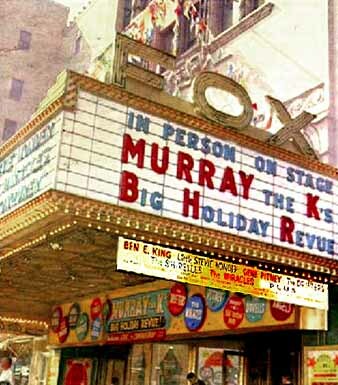 After Freed was through, and until 1965 (when WINS was sold, and it switched to the all news format it still has today), Murray the K was clearly the undisputed king of the New York City radio airwaves. Enjoying most of his success and popularity throughout the '60s, Murray was still going strong until cancer took his life on February 21, 1982, at the age of 60. He was honored posthumously by induction in the Radio Hall of Fame in 1997. For more about Murray Kaufman, go to http://www.murraythek.com. Alan Freed, the "Father of Rock 'n' Roll," and his "Rock 'n' Roll Party"
Jocko and his "Rocket Ship Show " ─ "the hottest show on the radio"
Copyright © 2001-2012 by Howard B. Levy and 1960 Sailors Association Inc. All rights reserved.